I ran across a challenge blog The Male Room that I wanted to try out and work on my manly themed cards. The current theme is fall/autumn. Deer hunting season is a favorite fall pastime in my neck of the woods (not mine!). This stag image seemed a perfect fit for this theme. I am also linking this card up to the current School Colors theme challenge at Cards in Envy. Prairie where I graduated from high school had Orange & Black as their colors and a hawk as the mascot. Papers are by Authentique, Little Yellow Bicycle, and MakinMemories. Sentiment by Hero Arts. You nailed the challenges with this great card! I love the colors and image - so masculine! We have a hawk and orange and black as our school colors too. Love the dear head, perfect for a guy card! 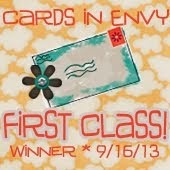 Thanks for joining us at Cards In Envy! What a fab guy card. Love the stag head and the super colours. Thanks so much for playing along with The Male Room this week! You nailed this male card! Your school colors are great for a fall card and the stagg head is beautiful! 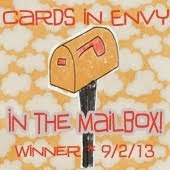 Thank you so much for sharing with us at Cards in Envy! Love your masculine card! Love the embossing and your design. Thanks for playing along with us at Cards in Envy. great colors, LOVE the deer and embossing!!! sooo glad you played along with Cards In Envy!!! Great Masculine card.Thanks for playing at Cards in Envy.